If you're new to skateboarding and want to know how to get better at skateboarding, there is a really simple answer: skate more and more. Practice is an only thing you need to do because more you will ride, the more your body and mind will adjust to the balance requirements and stresses of skating. Sometimes circumstances arise when you do not want to do it. It’s much easier not to do anything. But being lazy will not help you improve your skateboarding. If you want to be a better skateboarder, then you need to do skate. You can find complete skate videos on YouTube, showing many skateboarding tips for beginners from professionals, basic to advance level. Keep in mind that most video parts are heavily edited. But, you can glean a plenty of things from these videos – where to put your feet, how to stop the board, how to shift your body weight, etc. Often people seem to practice simple enough, but if you want to succeed, more and more practice is a must. The more hours you devote to your sport, the quicker you will see the result. Devote your time and energy on skateboarding. It will be a beneficial step towards your success. 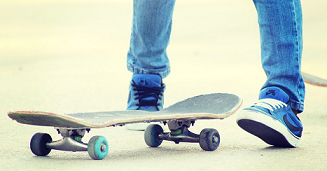 To find the best skateboard partner is a great initiative for getting better in this sport. Often a fact comes in hearing that you become like the people you surround yourself with. If there will be better skaters around you, definitely you too will become one of them. Recording yourself and watching on video is another great way to improve your skateboarding skills. You can critique yourself on the point where you’re doing wrong and can make a plan to change to get it right. Whether your friends are skaters or not, you need to meet other skaters soon enough. Watch them when they skate. Consider how they manipulate the board with their feet, and how they get their body into the right position. There is always an easier way to perform the tricks; you just need to observe people that can do it effortlessly. In case of any doubt, ask questions from them. Don't be afraid to fall. Just skate freely, be safe, and have fun. Be courageous to step outside of your comfort zone. Conquer your fear and enjoy skateboarding. Envision yourself as a professional performing your tricks successfully. Repeat this continuously until you believe you can do it. Now try the tricks with confidence. It is one of the secrets to skateboarding like a pro. Envisage yourself as a successful skateboarder, and you will be one of them soon. Author Bio :I am Koshial Robinson, Founder of Skateboard blog, its a blog about Skating tips, Skateboard guide, Product reviews, news, equipments, and events.